I’m not normal. I’ve never developed a sweet tooth I couldn’t satisfy with something savory. I’m not one of the 52 percent of adult Americans who like chocolate best, and though I’m way over 18, I cannot admit to consuming 25 pounds of candy every year. I’ve been known to break open a bag of Candy Corn at Halloween, pop some Jelly Beans at Easter, but never touch Fairy Floss, better known as Cotton Candy. Still, I can appreciate why the Aztec considered chocolate an aphrodisiac. Just think of the sacrifices they made after experiencing that first rush of love! Our National Chocolate Day has come and gone but it’s never too late to candy a few words in honor of National Poetry Month. Maybe the best thing about my contribution to the genre known as candy bar poems is this: it’s nonfat, guaranteed to be calorie-free. to bring home a little Bit-o-Honey. long, too long, to be her Atomic Fire Ball. to 3 Musketeers and Lemonheads. and dirty doing Rolo’s famous Tootsie Roll! he’d have to dispense with these Hot Tamales. your Mary Jane hanging with Mr. Goodbar! not one Sour Punch in the bunch. couldn’t want for more Amazin’ Fruit in one place. all the while whispering, O Henry! Let’s just Take 5. Buy a year of Every Day Poems, just $2.99— Read a poem a day, become a better poet. In April we’re exploring the theme Candy. Usually with a little hot pepper by way of the Aztecs. Better that somebody than I.
OH my land! I love this… even though as an insulin-dependent diabetic, I’ve never been a candy-eater either. My husband is in love with Almond Rocca, almost as much as with me. Maureen, you’re amazing! My sugar high for the day. Darlene, do we get to know what the chimp does with his Easter basket? Poetically, that is. Violet, I won’t tell you how many pounds I put on in the service of poetry-writing. Thank you for reading and commenting! Happy Easter! Since it’s National Poetry Month, my daughter is doing a poetry notebook, and she’s miserable. I try to tell her that poetry can be fun, but fun poetry does not get points in public school. This, my dear, is a fun poem. I wonder if chimp will become a new poetry form. Maureen, this was wonderful. And hearing you read it added calories. … cool Ricola singing her aria. Megan, fun poetry does not get points?! There outta be a law! Is your daughter allowed to write a found poem? 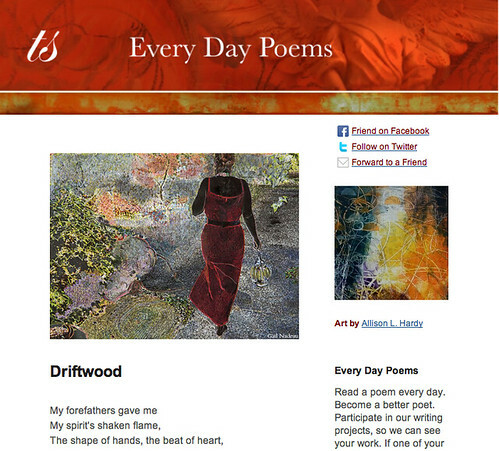 The Phillips Museum is running a found poetry challenge (via its The Experiment Station blog). I just submitted a poem (perhaps a little risque for public school) using text from one of the museum’s Web pages. Maybe your daughter could be inspired by looking at the art on the Web pages. Lyla, Ricola and Original Herb may be the lightest sweets in this confection. Glad you enjoyed the audio! I’m with Megan: this is a fun poem! Yay for candy! Yay for you for managing to incorporate so much candy into one poem! Monica and Kimberlee, thank you so much for reading and commenting. I think this poem has more than satisfied any remaining sweet tooth. The audio is also available on my Sound Cloud page. Thank you to all the many people who have listened to the poem there. Poetry is so underrated. This one is so sweet and fun! Miss Tootsie Roll would melt after reading this marvelous poem. Delighted you stopped in for a little sweet. Thank you for reading and commenting. Now that was D E L I C I O U S ! Oh, wow. That was glorious. So pleased my personal favorite, Peppermint Patty, was included in the first stanza!